As always, we keep the wish for peace in Israel deeply in our hearts. This piece was inspired by a trip my son Michael and grandson Ezra made to Israel. A dream inspired this illumination revealing that from the hearts and souls of all women, we will be blessed with peace. This makes a meaningful gift for a Bat Mitzvah and can be personalized. Framed and double matted 16” x 18”. Printed with archival ink on fine art velvet paper. Frame is 2″ gold painted wooden frame (other framing options available). FREE Personalization and SHIPPING!! This is so beautiful. I think it should be used by Nashot haKotel-Women of the Wall. I love this inspirational image. I’ve purchased it many times as a perfect and welcomed Bat Mitzvah gift. I love your work. When I get back from my trip to Israel, I’m going to try and make some room on my walls for one of your pieces. I love this picture – just bought it for my daughter for her birthday. 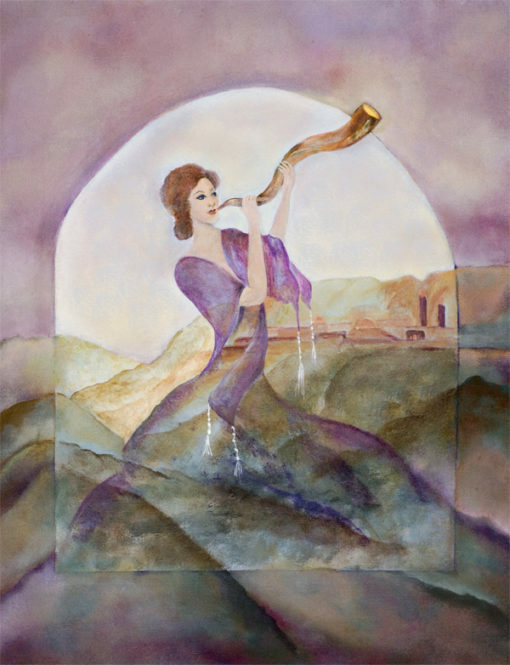 She blows shofar at her Temple during the high holidays. 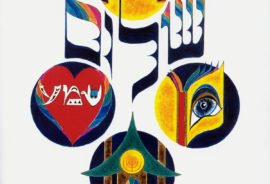 This was recently ordered for a Bat Mitzvah for twins – each girl was gifted with this image, inscribed with their names, date of the Bat Mitzvah and their Parsha.